This is the possibly the quickest dinner to russle up that delivers on taste, nourishment and style! Making your own pesto is an added extra but shop-bought works fine too. The pesto should keep fresh for at least 5 days in a jar in the fridge. Prepare the chicken marinade the night before so all you have to do is pop it into the oven when you arrive in the door come evening. For the pesto: roast the almonds for about 20 mins at 180°C until the colour darkens but doesn’t burn! Add the roasted almonds, basil, garlic, lemon juice and 2 tbsp oil to a food processor and blitz until the almonds have broken down considerably, slowly adding the remaining oil. Grate in the Parmesan and continue to blitz until smooth. Add more oil if it is too dry. 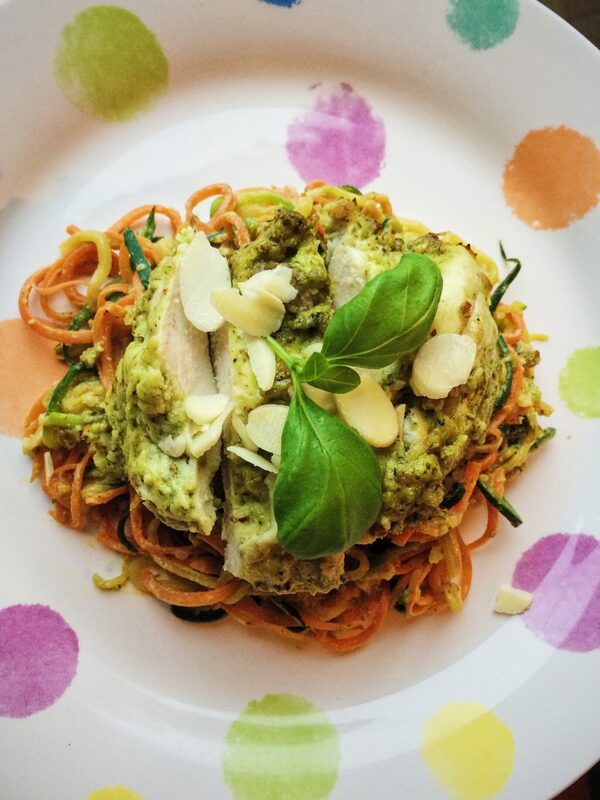 To marinade the chicken, simply place the pesto and natural yoghurt into a resealable bag, add the chicken, close the bag and mush it around until the chicken is well covered. If the night before, leave the chicken in the bag in the fridge. Otherwise, pour the chicken and contents into an ovenproof dish. Bake in the oven at 180°C for about 20 mins until the chicken is cooked through. Using a spiraliser/Julienne peeler/edgy knife, create thin long strands of the courgette and carrot. Place a large frying pan over a high heat, ensure the pan is hot enough by adding one veg strand and it should hiss once it hits the pan. Add the remaining veg and continuously toss ensuring they don’t stick. Reduce the heat and stir through some of the pesto juices from the chicken. Add more pesto and natural yoghurt if you want a more creamy sauce. To serve: slice the chicken into generous slices and serve on a bed of vegetables.